Facebook's dirty tricks have been exposed, they will never completely regain the trust of users. Facebook (FB) is ultimately and primarily a tool of the intelligence agencies (primarily but not exclusively the CIA) and furthers a larger agenda as part of the DOD's "Information Awareness" program, more than it is a hot business model. "Top Reasons Facebook (FB) is going down fast"
Mark Zuckerberg originally referred to his users as "Dumb Fucks" this meme is now being circulated. Cambridge Analytica is not unique. This is the underlying model of Facebook's business model (if you can call it a 'model'). Facebook's IPO disaster was a sign of things to come. Cook County is suing for 'fraud' - this is a public government suing Facebook for SERIOUS violations. Fraud isn't something you can just get over. It takes years to make a reputation and minutes to lose it. Once the genie is out of the bottle, hard to put back. Perhaps some users didn't think this was going on and others didn't care. But now there's a movement to control how Facebook spies on you. 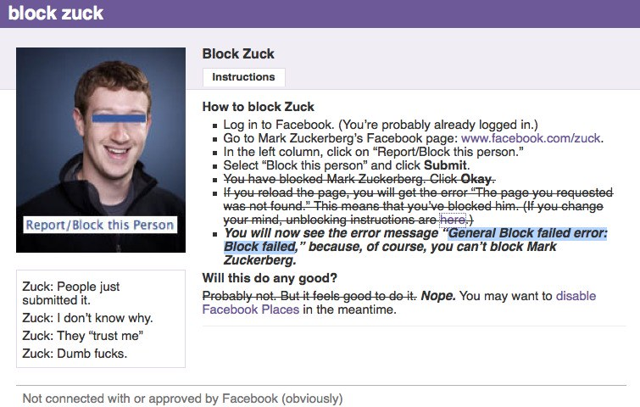 Remember one thing, Facebook (FB) users - you use FB with your consent. This author deleted FB years ago, as have millions of others. If you really like the idea of social network there are hundreds of others. Or set one up yourself for sharing family photos with Grandma. JomSocial can turn any Joomla site into a social media site. Lawsuits are nothing new, one could say that Facebook (FB) itself was born out of a lawsuit (with Winkelvoss). The point here is investors that this is the beginning of a crap storm that has been brewing for years but it didn't metastasize until now. Facebook is going to zero. If you're long get out now before it drops further. There's nothing supporting the stock except hopers and hot air. One last thing, Fake News started on Facebook (FB) see articles here, here, and here. Since the Trump election there has been a backlash on 'Fake News' sites, which Facebook is #1. It's a platform for Fake News! News existed before Fakebook and will continue to exist. Facebook is to the internet was the Laser Disc was to the home movie industry. It's outdated, it's bloated, it's hype - there's nothing there. Move on, drones. Nothing to see here.